Assembly Member Rodneyse Bichotte (right) told NY! 's Grace Rauh that she now supports congestion pricing. One of congestion pricing’s highest-profile opponents has done an about-face and now supports the tolling plan, just two days after issuing a scathing takedown calling the proposal a tax on the poor. How Streetsblog covered the story last week. Pressed by the show’s host, Grace Rauh, as to whether she will now vote in favor of congestion pricing, Bichotte suggested that she would. “Many of my concerns were addressed,” she said, citing meetings with MTA President Pat Foye and Assembly Speaker Carl Heastie, who did not cite Bichotte when he declared on Monday night that he had lined up the votes he needed. Bichotte added that she is now confident that the congestion pricing toll revenue would indeed go into an MTA lockbox. But the Assembly Member did raise the specter that Albany lawmakers will create so many exemptions to the tolls that the program might not raise enough revenue to succeed in generating the expected $1 billion. Bichotte suggested that $60,000 — which is nearly double the median income in her Flatbush district — might not be high enough. “We do have members with eight or seven children, and what happens to those who make $70,000 or $80,000?” she asked. Bichotte added that the legislature would continue discussions of exemptions after it passes congestion pricing. “We are told that these things will be addressed at a later time,” she said, adding that she hopes to create more room for exemptions by pushing for passage of a millionaire’s tax and a return of the commuter tax. It is unclear why there will be exemptions of any kind for congestion pricing tolls, given that there are no such carveouts for any existing tolls, such as for the Queens-Midtown Tunnel or the George Washington Bridge. Congestion pricing would only charge a toll on drivers entering Manhattan’s central business district — an area to which there are abundant public transit options. Congestion pricing has the potential to fix the transit system and make our streets saner and safer. In a city with ancient subway infrastructure, abysmally slow buses, and chronic gridlock, why would anyone want to water down a plan intended to fix those things? Compared to those who ride transit, the number of New Yorkers who commute by car into Manhattan is quite small, and on average, car commuters earn twice as much as transit commuters. So when lawmakers talk about wanting carve-outs, they’re putting the wishes of a comparatively small group of people ahead of the transit-riding majority. 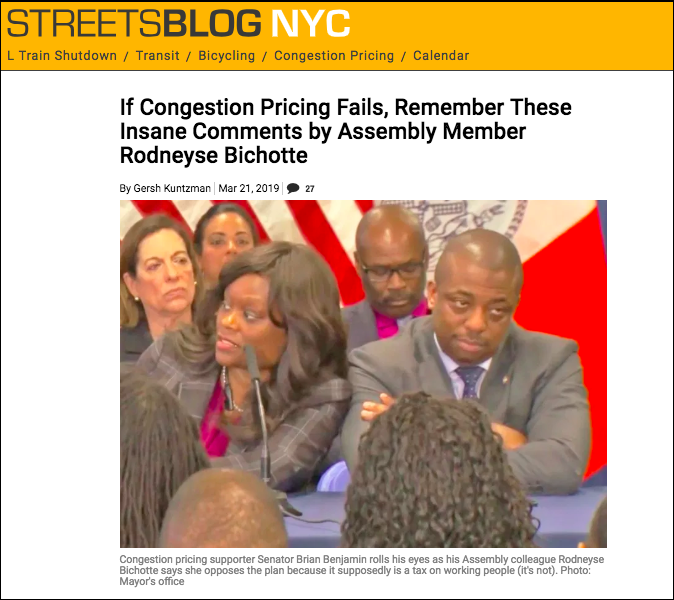 But regardless of the talk of exemptions, Bichotte’s conversion to congestion pricing supporter comes after nearly a week of criticism of her initial position. Before Tuesday, Bichotte had said that she saw congestion pricing as a tax on low-income drivers, even though only a tiny fraction of her constituents drive into the central business district regularly — and those who do tend to be far wealthier than their transit-riding neighbors. Putting aside for a moment whether or not having exemptions based on income makes any sense, does she not realize the HUGE bureaucracy this would create, diverting money which could be used for other things to a bunch of bean counters? First, the city will need to verify the income of anyone who passes into the cordon zone before deciding whether or not to charge them. How will it do that? The person driving the car might not necessarily be the car owner. Even if you assume the car owner is the driver, you’ll need to request copies of their tax returns. However, that’s not enough. The tax returns at best show income from the prior year. What if they’re over the income limit this year? Do you not charge them now, based on last year’s income, and if this year’s tax return shows they’re over the limit do you then bill them retroactively next year? Easy to see how this can become a bureaucratic nightmare. Second, it’s really easy for people to cheat under such a system. They can register their car to someone else in their household who has lower income. Or they might have sources of income off the books which would put them over the limit if such sources were counted. The bottom line is any system of exemptions based on income is unduly complex and/or open to cheating. Why should it become the taxpayer’s business to subsidize someone who has more children than they can afford, especially subsidizing that person driving? My guess is it’ll be pretty slim pickings finding car owners among that group. If lawmakers absolutely insist that drivers ought to get some sort of rebate for tolls they pay, the way to do it is through state income taxes. I vaguely remember getting a little kickback from my state income taxes when I lived in Massachusetts. This way there’s no application process, proof of income, etc. And this goes without saying that if low-income New Yorkers get tax credits for tolls, they should get an equal or greater kickback for their transit fares. OWNED. But that’s what tends to happen whenever you go out–way out–on a retarded limb. This reads like a sore loser article. No need to dedicate any column inches into such an out of touch, inaffective legislator. She doesn’t deserve the press hits. As for the carve outs, they’re dumb — but also only a very tiny (maybe two hands worth) of people would actually qualify and use it. Not worth the breathe from advocates. Better to focus on what MTA and DOT are going to do to ensure transit is actually a better alternative for these folks.